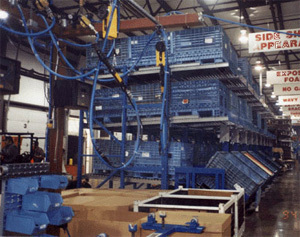 A Carton Flow Tilter System can provide multiple pallet container feeds and storage along assembly lines and work cells. Each unit has one container in the work position and is fed by an in-feed lane and empties into a return line. Overhead buffer/backup storage lanes are also available to increase storage capacity. Flow-Rite Inc., can provide a Carton Flow Tilter System based on your warehouse picking requirements. Please contact us for a free assessment.